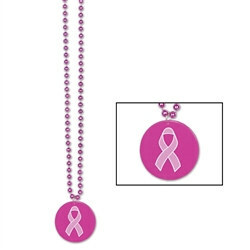 Show your support for Breast Cancer awareness by wearing these Pink Beads with Printed Pink Ribbon Medallion. Each package includes 1 pink beaded necklace measuring 33 inches in length. Attached is a pink plasic medallion with a pink ribbon on the front. Get yours today and start showing your support! Proceeds from sales of this item will be donated to the National Breast Cancer Fund. If you like this pink ribbon meadallion necklace, you may also like our metallic Pink Ribbon Beads which come in a set of three beads or the white beads with a sculpted Pink Ribbon icon. Proceeds from sales of this item will be donated to the National Breast Cancer Fund. Check out all of our Pink Ribbon products. We walk with my Mom each year for Breast Cancer in Long Island. This past year she was ten years cancer free so we threw a party! The necklaces looked great on everyone.